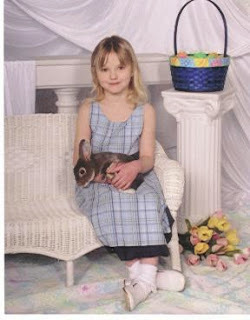 Some of our kids are big fans of a local “get your photo taken with a real live bunny” tradition. 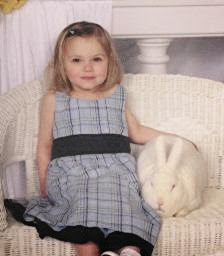 Although this is them without the bunny. 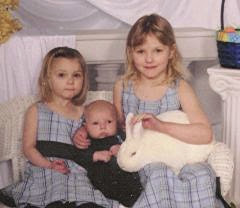 Here is the three of them with the bunny. The girls have both decides that they want to grow out their bangs. Emily will not let me pin them out of her face during this awkward phase and it drives me mad. 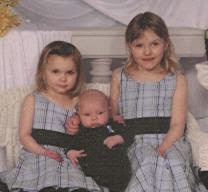 My mom used to always tell my brother and me that we looked like ragamuffins. I think this is the look she meant. Claudia will let me pin hers back from time to time and it makes a huge difference. William has no hair to pin anywhere. 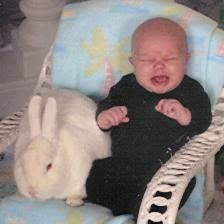 Plus, he isn’t a real big fan of bunnies anyway. I think he may have been exposed to one too many Monty Python movies.